Once again Michelle Benson has done an outstanding job putting together a video of our girl’s winning effort on Memorial Day. ENJOY! Attached is the chart of MARYJEAN’s race. A chart is put together at the end of every race by a “chart caller” who works for the Equibase company. From these charts come the official time, purse distribution, order of finish, official lengths between finishers as well as the comments about how each horse ran in the race. The line in the past performances that gives you a brief summary of the type of trip the horse had in a particular race comes from these comments. Take a look at the chart I’ve attached and let me know if you have any questions about it. MARYJEAN surging to the lead! The Club kicked off in style this season by winning it’s initial outing (I like this tradition we’ve started!!)! MARYJEAN, under Alex Canchari, passed HOLLYWOOD KNOCKOUT in deep stretch to bring us to 1-0 an the season. She was very well placed throughout and once Alex got her to change leads mid-stretch, she was really able to dig in and get passed her rival. Keep in mind that HOLLYWOOD KNOCKOUT has hit the board in several allowance races at Remington and Prairie Meadows, so this win was even more impressive to me than just beating a bunch of $10,000 claimers. She came back to the barn and cooled out just fine though you never really know for a day or two after a race how well they came back. Clay told me he’d call me if he had to but that no news is good news – so let’s hope for the silent treatment for the next day or so. Thanks and kudos go out to Alex, Clay, Juan and the rest of “Team Brinson” to get the job done for us! Winners’ Circle photos will be available from Saturday forward at the gift shop on the first floor just inside from the paddock. We will have an initial run of 40 there at $10 each. Once those are sold out you can order one there and pick it up in about two racing days by bringing in your receipt and ID. The Winners’ Circle was a bit more crazy than usual this time and we’re going to work on having the next one taken on the racetrack so it’s not as confining for the people and the horse – providing we’re fortunate enough to get there again. We finally get on the racetrack as MARYJEAN heads to the oval to take on five other fillies and mares in a $10,000 claiming race going six furlongs with a purse of $17,000. 1 – Glamour Galore (Westermann/Olesiak): Last three attempts have been in stakes races, albeit at Fonner Park and with little success. 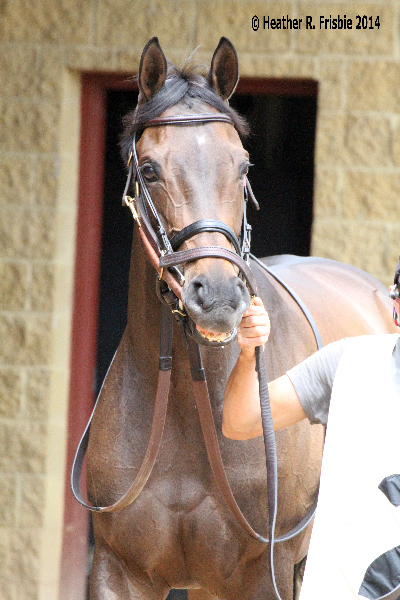 Claimed for $10,000 last fall out of Keeneland, she was able to capture a $10,000 starter allowance at Oaklawn first out for the new connections but only hit the board once since. 3 – Hollywood Knockout (Stuart/ Escobar): Placed 3rd in a first level allowance race at Prairie Meadows in her first start of the season and then up the track in a $12,000 Optional Claiming race. She looks like she’ll want to come off the pace which, though easier this weekend, is a tough task in a Canterbury dirt sprint. 5 – Nevergetsold (Diodoro/Carreno): Is more speed. She beat a field of Turf Paradise allowance horses in wire to wire fashion to close out 2013 and then came out swinging this year, finishing second at $16,000, unable to hold her lead in the stretch. 6 – The Bosser (Turco/Hamilton): The third Nebraska shipper in the field, she’s hit the board in both of her 2014 starts, her last a second place finish as a victim to EPIGRAPH’s winning streak. She likes to stalk and may be in a good position to slip in behind the speed on her inside. Our girl stacks up pretty well in here but it’s certainly no cake walk. She should be in really good position with the early pace and her speed figure in her last race makes her a clear threat in here if she can repeat it. The morning line favorite, GLAMOR GALORE, is going to want to try the same tactic and it may come down to which mare can come out standing after slugging it out through the lane. 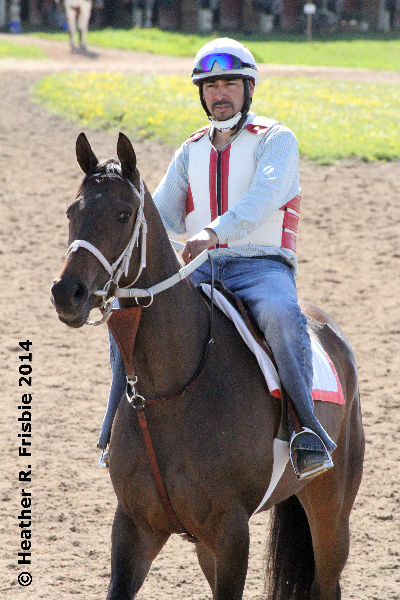 Hopefully the Prairie Meadow shipper, HOLLYWOOD KNOCKOUT, won’t be there to pick up the pieces if everyone falters. It’s not going to be easy but it sure is possible. The race filled and MARYJEAN makes her first start for us on Monday afternoon in the 4th race. 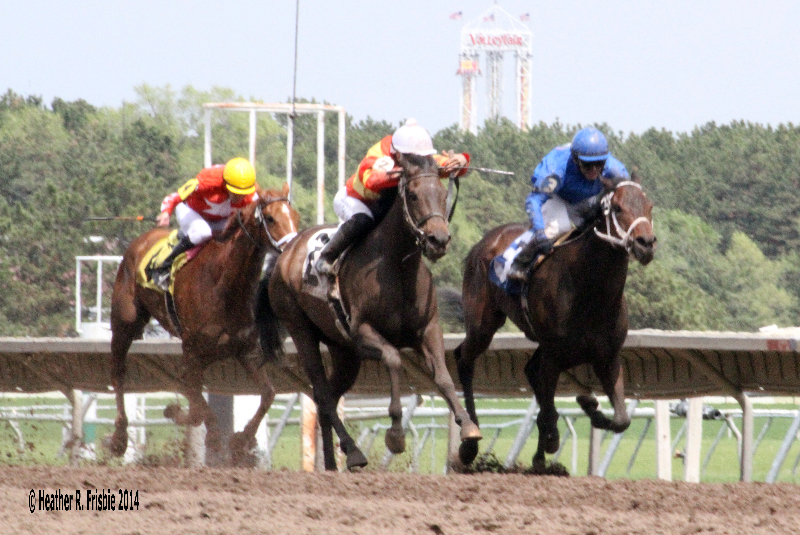 It is a $10,000 Claiming race going six furlongs over the main track. MJ drew post 2 in the six horse field and we will employ the riding services of Alex Canchari – a Canterbury Club favorite after piloting ASK EDDY to several victories last year. There will be a section in Silks reserved for the Club, just go to Silks and follow the signs to the Canterbury Club gathering. I will be down there at some point to check in with you all and lead Group 3 to the paddock! NOW things start getting fun!! I will have a detailed breakdown of the race later in the weekend. Good luck!! The race that we were pointing to did not fill for Sunday. It was brought back as an “extra” for Monday which means that they will take entries on the race again and hopefully there will be a few more so that the race can be used on Memorial Day. Entries will be drawn for Monday tomorrow so by mid-afternoon tomorrow we will know if we’re racing on Monday. Given the sheer size of the racing Club, the last few years we have split the group into several smaller groups and rotated paddock access. There have been a few requests to start at another point rather than the front of the alphabet, so this year I split the group into five and then drew a number out of a hat to see which group would lead us off. This year, Group 3 will be the initial group and then we’ll follow with Group 4, Group 5, Group 1, Group 2 for each consecutive start. We’d like to limit paddock access to Club members +1. It gets very dangerous for people and horses when large numbers of people are in the paddock. Twice last year there were near incidents (thankfully not while we were in there and no one got hurt) with one Quarter Horse nearly scampering through the center of the walking ring and one Thoroughbred actually getting loose and breaking through the fence before being corralled. Both could have been disastrous. – If the horses are already walking in the walking ring you are too late. Do NOT enter the paddock once the horses have come out from the saddling area. – When in the paddock, try to be near the number that corresponds with our horse and fill in behind the number toward the center of the paddock. Other folks wants to be with their horses as well so we don’t want to overflow into their spots. – Stay several feet back from the dirt walking ring in the grass area. Crowding near the jockey and trainer could create a situation where the horses get spooked. – Be aware! It’s an exciting place to be but just be aware of your surroundings and what is going on. Just in case! Heather is working with Coady Photography to try and come up with a plan for Winners’ Circle photos if we’re lucky enough to win a race. Last year the Circle got a little crazy and the potential for someone to get hurt is very real. I hope to announce a plan on Saturday – just in case we run and get lucky on Sunday! Remember: we’ll be starting with GROUP 3 on Sunday (if the race goes and we run! ).